Referencing his 30-year career in law enforcement with the Sacramento Sheriff's Department, this morning Assemblymember Jim Cooper (D - Elk Grove) held a press conference regarding Assembly Bill 16. 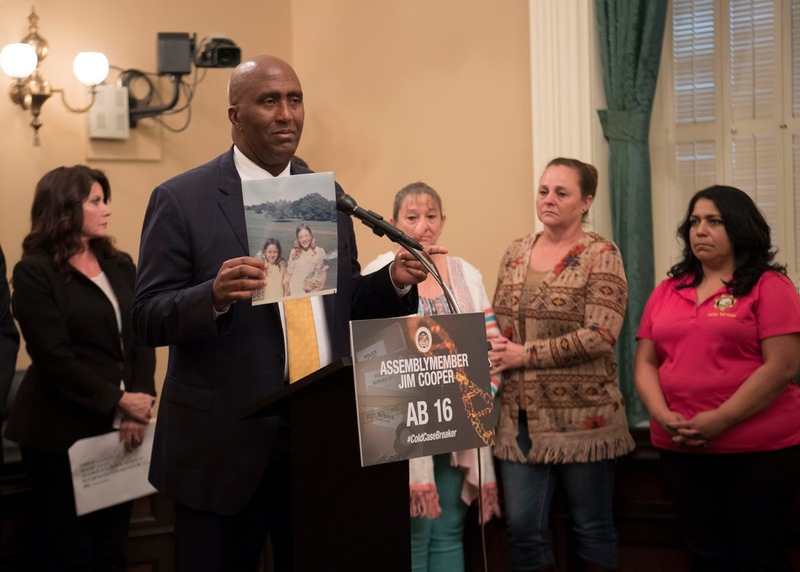 If approved and signed into legislation, AB 16 would allow law enforcement agencies to gather DNA samples from a class of misdemeanor convictions that were previously classified as felonies. Those misdemeanors include shoplifting, forgery, insufficient funds, petty theft, receiving stolen property, petty theft with a prior, and drug possession offenses. "I spent three decades in law enforcement, and you don't lose your passion your passion for standing up for victim's rights," Cooper said. "That is why we have AB 16." Following the 2014 voter approval of Proposition 47 certain felonies was downgraded to misdemeanors, and the ability of law enforcement of collecting DNA samples was also stripped. Since the implementation of Proposition 47, Cooper said the collection of DNA samples dropped from about 15,000 per month in California to 5,000. "AB 16 would allow collection of DNA upon misdemeanor conviction of those crimes," he said. "So a higher standard of misdemeanor conviction." Cooper also stressed the DNA collection could also help exonerate people wrongly convicted saying it would ensure "the integrity of convictions so that innocent individuals are not needlessly arrested and prosecuted." Referencing a recent cold case murder in Yuba County that was solved after 41-years, Cooper choked up discussing the matter. In that case, two men plead to the crime after their DNA was matched on the database. "One of the last pictures of those girls was taken at Easter. That's next month," he said. "Those girls never had another Easter. And, man, I just get emotional about it." "We got to do what is right, and step up," Cooper added as he choked up. Also speaking during the news conference was Stan Vantassel, a nephew of Doris Derryberry, one of the two victims in the Yuba County case. Vantassel noted in the committee hearing just before the news conference that someone testified that the bill would be discriminatory. "DNA brought justice to the two people that killed and brought harm to my aunt and her friend, and there was no discrimination to that," Stan said. "If it was not for that DNA evidence we would not be standing here today." In that Assembly Public Safety Committee hearing testimony was heard, but no vote was taken. A representative from Cooper's office said it is anticipated the matter will be brought up for a committee vote in the next few weeks. Cooper stated the bill, which is facing civil liberties challenges and resistance from some Assemblymembers, would be approved if it were put to a vote of the people. "If this goes to ballot, voters will overwhelming pass this bill," said. "That is not out of the realm of possibility of seeking a ballot measure." Do not be fooled by this bill! Jim Cooper wants you to believe that that some loophole was overlooked by voters in proposition 47. That's wrong. It wasn't a loophole, but a main feature of the bill. The voters chose to reduce the charges of certain crimes from felony to misdemeanor. This includes no longer taking blood and fingerprints from people charged with these crimes. That's right, charged! Once charged, they will take your DNA and fingerprints and put them in the database; and you can never get them off the database even if they drop the charges. What misdemeanor charges are so bad Jim Cooper wants them to be held to a higher standard than other misdemeanors? Thefts of under $950 and misdemeanor drug possession charges, including the possession of marijuana! Jim Cooper is seeking to circumvent the will of the people and push AB-16 through congress. If he had his way, he'd make it mandatory for everyone to have their DNA and fingerprints added to the database. Do not be deceived by stories exploiting tragedies to give away our rights to the police. Time and again we've seen the terrifying consequences of this; from the '94 crime bill, to the Patriot Act, to 3 strikes. Don't be fooled by Jim Cooper, who feels the police can do no wrong; we know the truth!